Beading Arts: Special seed bead giveaway! My friend Ekaterina at The Best Beads has done it again! She is an expert in Czech glass, and has graciously provided a very special treasure for a lucky winner...four bags of seed beads at 50 grams each! Three bags of seed beads are from Preciosa Ornela, and are 2mm silver lined rocailles. 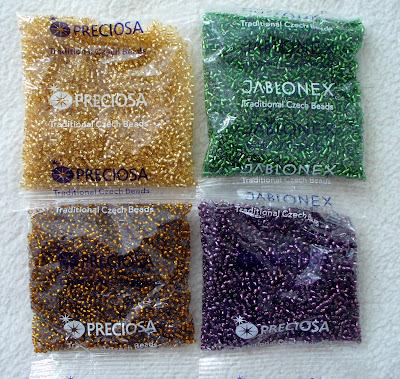 The last bag of seed beads is a rare find made Jablonex, which hasn't even existed for almost three years. Ekaterina was lucky to find remainders of their stock in Jablonec! I have to say that my favourite bead stitch is also peyote, I love the texture of it. Thank you for the opportunity to win this. Peyote for sure! I was always under impression I could never learn this stitch...but it was actually easy to learn! I've now even accomplished both odd and even peyote! Yea!!! Oh my! What a great give away! I am not a "seed beader", but I have dabbled. It's not a "stitch" but I made some beaded fringe that was pretty cool! cynthiariggs58 at gmail dot com. I love to use seed beads to paint on canvas with. I use them on works of art as an added bling!!! Love!!!! I'm hooked on Peyote - it's to versatile. I have never met a seed bead stitch that I didn't love... but the stars of my moment are cross-weaving, netting and Saraguro leaf (a modified brick stitch), to narrow it down lol! I love the peyote stitch. I haven't mat a seed bead stitch I didn't love but my favorite has to be herringbone stitch, I love the fluidity of it! I am just starting to do seed bead weaving and am looking for seed beads that are precision made. I think my fav seed bead technique would be spiral. I am currently learning Peyote and but quite have the hang of it yet. My favorite stitch is peyote, and I'd love to use those beads! I would love to be the winner of the seed bead giveaway. I totally enjoy beadweaving and my favorite stitch is Peyote combined with Ndebele. I love beading. If I had to pick a favorite I guess it would be peyote. But I am not to picky. I just love it. That is how I relax everyday. I am just starting my jewelry design career / hobby / life? I would love to win these seed beads. I would use them to make rings. Thank you for your website and the lovely giveaways! I love the peyote stitch. I love to sew and this stitch feel's like sewing. It's very relaxing. Thank you for a chance to win this gift. Peyote is my favorite stitch. I love the way it looks and feels. These beads are beautiful! thank you for the giveaway offer. I pinned your post link to Pinterest. Please enter me in the seed bead giveaway contest. The back stitch in bead embroidery is my favorite stitch at this time. I love the calming effect bead embroidery provides and sparkly seed beads are my favorite! I just love the spiral stitch! So DNA double helix-like! I am new to beading so as of now I don't have a preferred stitch. I can You I love, love beads. After Cataract surgery in 1 week I will be able to see better also. As a relatively beginner to beading I would say peyote is one of my favourite stitches due to the variety of ways you can use the stitch. I love working in peyote. I adapt other patterns so I am able to do them in peyote. You are always SO generous - thank you in advance - I hope I win. My favorite beading technique is bead embroidery, which allows me to be as creative as my heart desires. I love peyote stitch the best!!! It is by far so fun and easy to do!!! Thank you for the chance to be in the contest!!!! I have been using seed beads with Kumihimo. I love the luxurious look I get with the seed beads. I can do the same pattern and change color of beads and get a completely different look. This adds to the fun, you never know what you will come up with. I like the daintiness of seed beads over larger beads. To name which stitch is my favorite is difficult since I love doing them all. I guess since I have to pick, it's a toss between RAW and Peyote. I love how the beads nestle together and adds that extra touch to each item. Cyndi I tweeted about your great giveaway. Peyote stitch is my favourite - combined with other stringing methods to make lovely free form bracelets. I would say that right angle weave is my favourite but I have not tried all the variety of beading designs available. The choice is endless. Great giveaway. I use seed beeds a lot but not for typical beading. I put them into the mini bottles with corks. To make "it's a girl charm", I use the pink and add girlish charms. "its a boy" I use blue and boy charms, for gardening I use green and gardening charms, for love I use red and heart charms and so on. The seed beads are perfect for this craft. I glue the cork on so the beads do not fall out and I add an eye screw to the top. 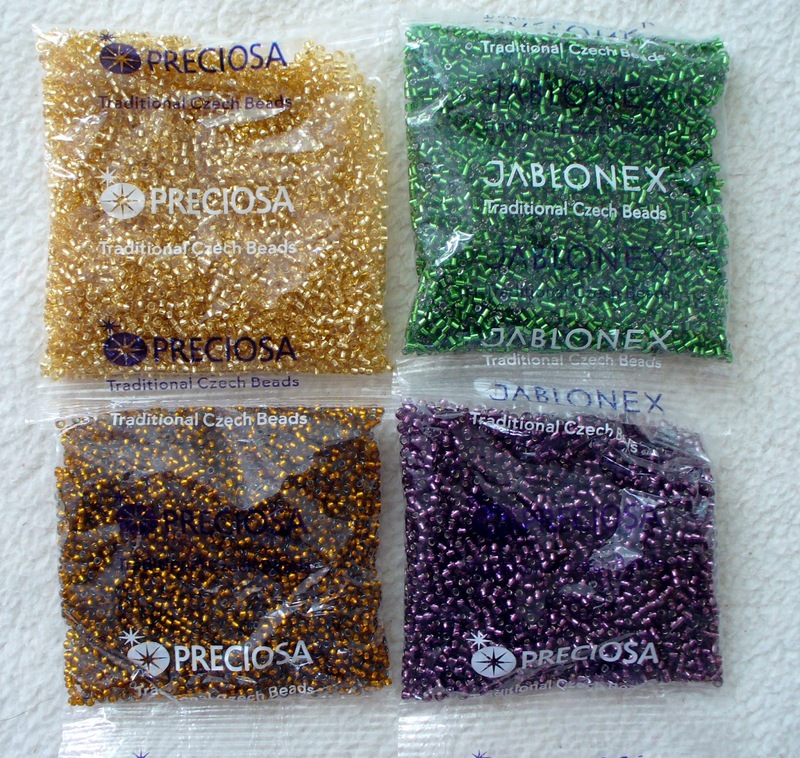 What a lovely prize, I love preciosa seed beads. I think my favourite would have to be St. Petersberg. It's delicate, and looks really difficult, but once I'd tried it once, I just fell in love with how easy it is to get a great finished piece. I just taught myself seed beading and I used the peyote stitch! I have 7 grandkids aged 15-2 years and they all love the texture and weight of the small sampler piece I made. I would say for now that Peyote is my favorite stitch! I posted twice on my FB the link for this contest! One went on for only my family and the other for my friends! At the moment, my favorite stitch is the braid stitch, from bead embroidery techniques. I have just started learning to embroider and it is fascinating with such potential. Besides, I just love playing with color. My favorite thing to do by far would be bead embroidery...to me its like painting with beads. I've posted every cuff and necklace I can find and would love to make them all! I love using my bead loom for seed beads. Otherwise I usually use them to embelish pieces. I'm starting in seed bead weaving. Herringbone and Brick Stitch are my favourite right now. Thank you for the giveaway. These are high quality seed beads. I used to do a lot of peyote stich years ago and have been wanting to get back to doing it! these beads are beautiful! I've shared this giveaway on Facebook.